How Do I Create a Private Outdoor Space? As youngsters, we had our bedroom where could hide away from too much family togetherness. And you know, we still need a little space we can call our own— or, at least, use on our own. And having such a space outdoors is perhaps the best escape of all. That’s true even if we already have a fabulous backyard. For if it wasn’t designed with a view for private time, it can be hard to find quiet: e.g., around an active barbecue, busy outdoor dining table, and especially near a pool. 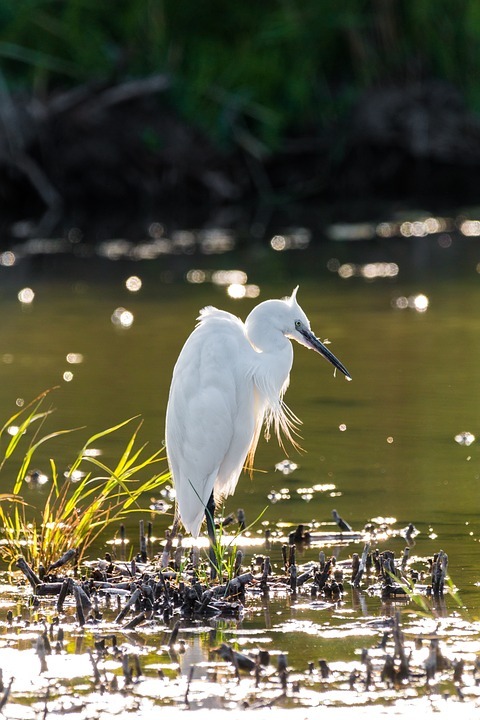 The next time you are outdoors, take a quick survey of your property and ask: Where would I love some quiet time? If you can’t point immediately to a ready-made spot — where you sneak away to read or do yoga, perhaps — it’s not all that hard to create such a spot. Remember that when it calls for it, your getaway can serve double-duty as a gathering place and a spot for solitude. And, no, that’s not a contradiction. If it is going to serve double-duty, all you need is a “do not disturb” sign that the family respects when it’s hanging in an agreed location. Plan an attractive focal point. 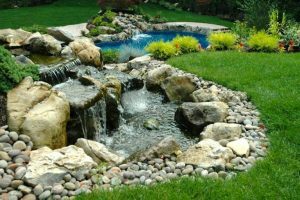 One of the enjoyments of an outdoor private space is being close to nature, so a water feature, special planting bed, babbling brook, butterfly garden, etc. are ideal options. These amenities will not only serve your new personal retreat, they can also be shared. 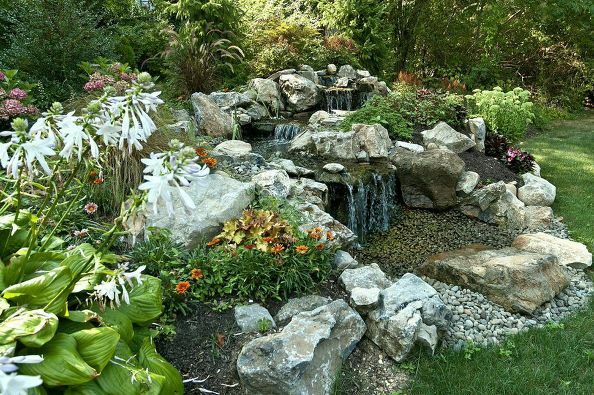 A waterfall, or pretty flower bed, by definition can’t help but be enjoyed from a variety of locations in the yard. Create a foundation for a getaway. 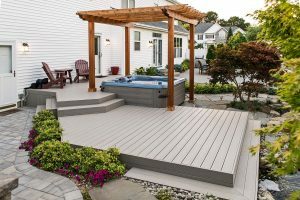 It can be very easy to extend an existing patio or deck, or add an entirely new area that will offer comfort and permanence underfoot. 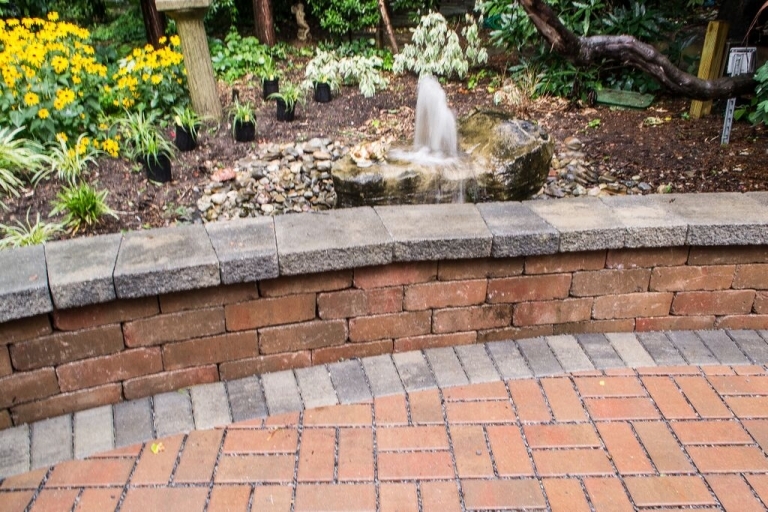 Techo-Bloc pavers were used to make this idyllic small patio sitting area next to the water feature. It’s a great spot to read, while sitting next to a trickling stream and the sounds of waterfalls. Note: The Techo-Bloc patio pavers were engineered in Canada, and they can well handle the freeze/thaw that occurs in our corner of the Northeast. Consider your comfort. 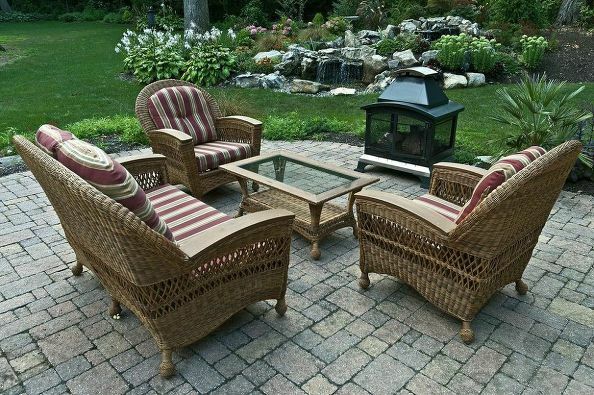 A few outdoor features such as comfy seating and shade are important. For seating, you might want a footstool (or a way to put your feet up), and a headrest; if you like movement, you might want a rocker or even a swing. 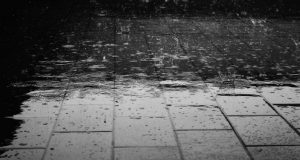 If there isn’t a shade tree, outdoor umbrellas, a pergola, trellis, etc. will do the trick. 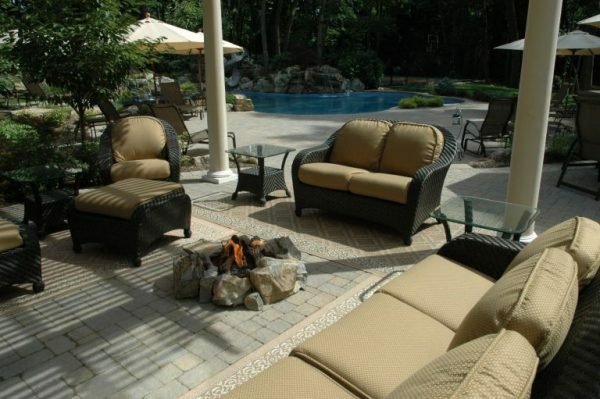 If you are planning a whole new patio, this is a great opportunity to plan ahead for that private space. Choosing a multi-level patio design like this Deck and Patio project makes delineating a private get-away space easy. Here, there’s a charming water feature flowing over moss rock covered in lush green ground cover; tall trees create privacy in the background; it’s snug and well away from other patio areas designed for sunning or sitting near the pool. 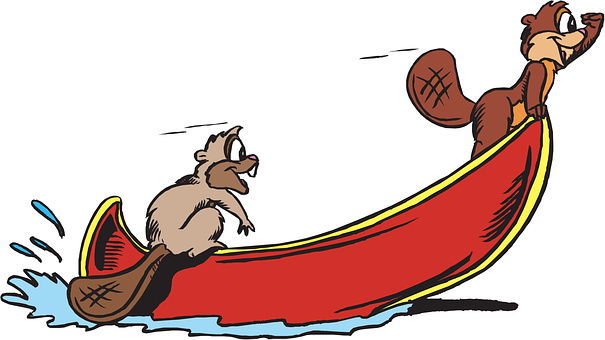 Think both ‘night’ and ‘day.” There’ll be times during the day when you’ll want to sneak away and perhaps read a book, or just listen to birds (and for that you might want to have a bird house or water fountain near your spot); other times you’ll be taking some ‘me’ time after sunset, so a fire pit or campfire will add warmth on cool evenings and offer pleasant lighting when it gets it’s dark. This is a pleasant example of a space that is great for guests and family as well as for quiet private time. In addition to a beautiful pool with spillover spa and natural-looking waterfalls, the homeowners had room to add an expansive patio with several areas designed for different uses. For their inviting seating area, they wanted a gas fire pit surrounded with natural rock that complemented the look of their pool’s waterfalls. It’s perfect in the evenings, too. By June Sullivan|2018-09-20T13:19:26-05:00September 20th, 2018|Backyard Escapes, Backyard Upgrades, Creative Design, Deck and Patios, Design and Build Experts, Fire Pits, Landscaping, Outdoor Furniture, Outdoor Living, Outdoor Rooms, Patios & Decks, Plantings/Pondscapes, Pondless Waterfalls, Ponds & Water Features, Unique Ideas, Updating Landscape|Comments Off on How Do I Create a Private Outdoor Space? First, Pond Fish Are A Good Thing! 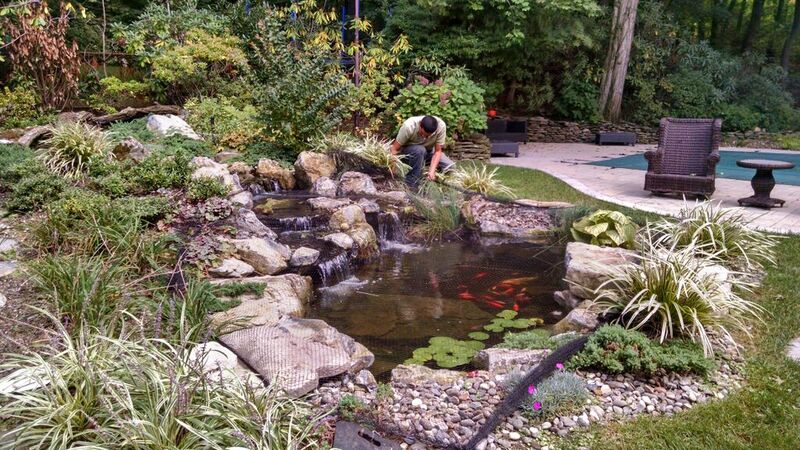 When a pond water feature is well-designed-and-built, koi will naturally help balance the entire pond ecosystem. 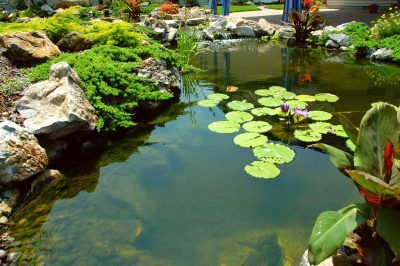 However, many pond owners fear that the fish will be harmed or will not survive. 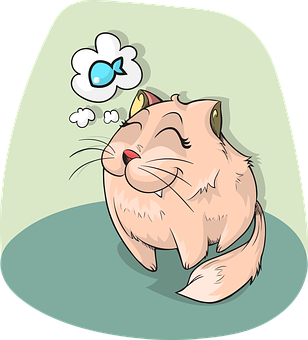 And while it is true that koi can be tempting to cats, raccoons, and herons, etc., there are precautions that will mitigate their attempts to reach your pond fish. 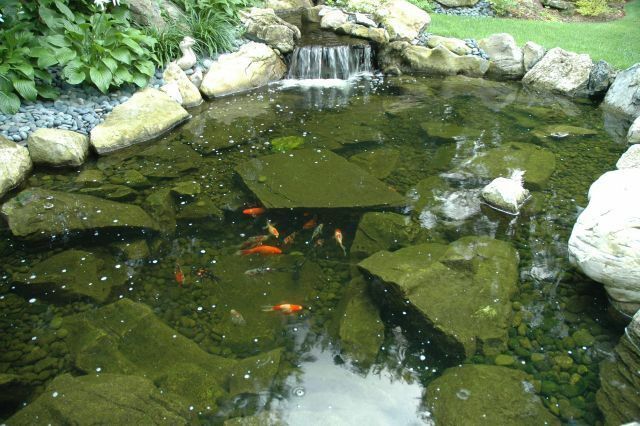 Adding koi castles and tunnels at the bottom of the pond will give fish a safe place to hide from many predators. 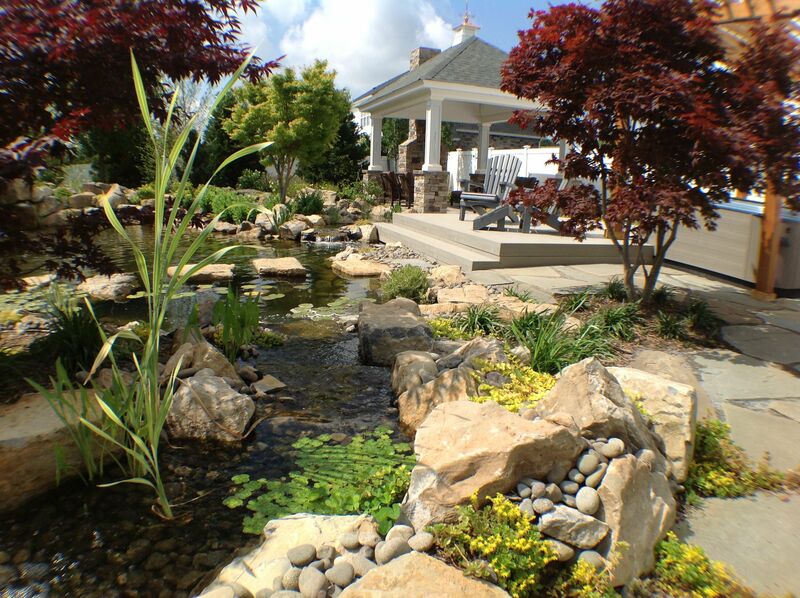 Include rock overhangs around the outside of the pond. 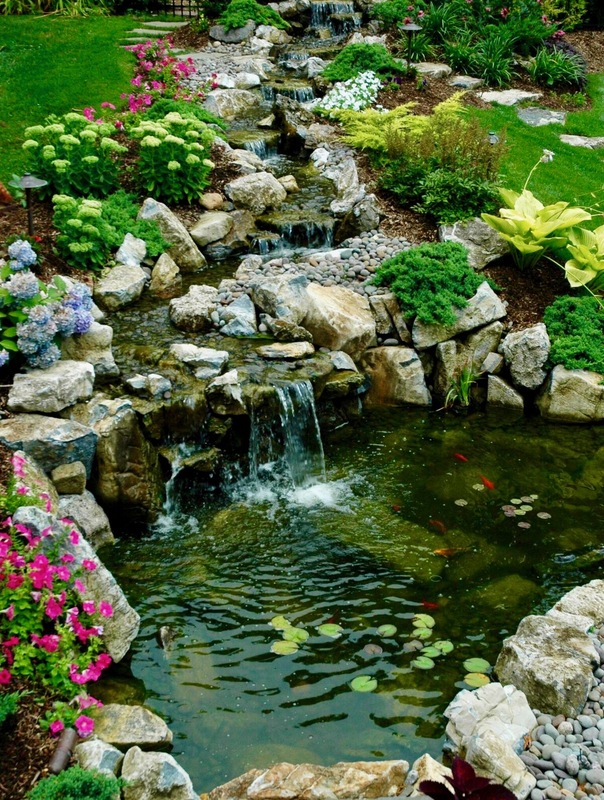 This will, first and foremost, make any pond appear more natural while discouraging cats and raccoons from reaching into the water after the fish. Planning a water feature with sufficient water depth can also dissuade raccoons and cats further, since neither enjoy swimming to get their dinner. Plus deeper water at the edges (more than 18” deep) discourages heron wading. Another helpful idea is adding a waterfall feature. 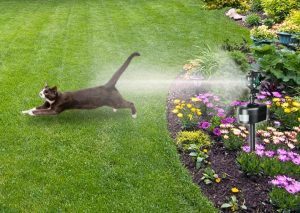 The continuous movement of its water, or even water from nearby sprinklers, will put off many avian predators. Herons, for example, do not like deep water. Photo Courtesy of the Laidback Gardener. Other precautions koi pond owners can take is installing scarecrows, such as owl statues. 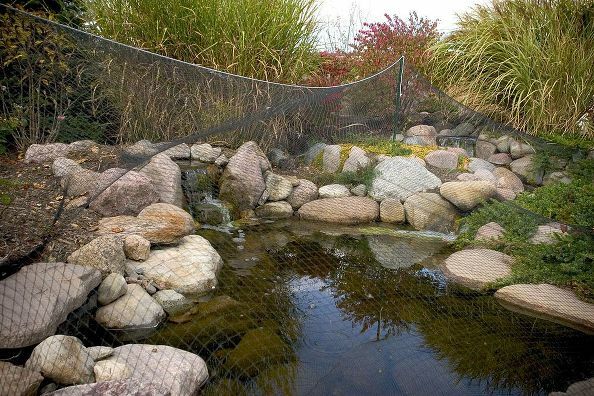 A net will also work, but most pond owners prefer to limit net use to fall foliage season. However, one particularly effective deterrent Deck and Patio has found is installing a motion-activated sprinkler. “At Deck and Patio, we believe that if you build your pond well, and install a motion-activated sprinkler, there really is no reason not to add koi to your pond,” says Dave Stockwell. Koi is a healthy part of this pond’s natural ecosystem; they have lots of room to hide as well as swim. The pond is sufficiently deep, including around the edges. There are also plenty of rock overhangs to discourage predators. Add a motion-activated sprinkler for the final bit of security, and you and there’s no reason to fear for your koi. 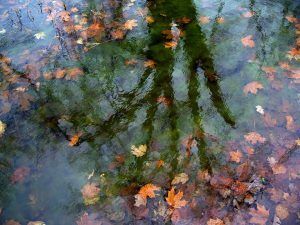 The feature photo at the top of today’s blog is artwork courtesy of the Laidback Gardener, Larry Hodgson. To design a natural looking waterscape system, several elements are key: well chosen natural stones, quality biological filtration systems, and a wide range of ground and aquatic plants. When chosen well, and positioned perfectly, rocks can make a man-made waterfall and stream appear as if they’re flowing from a natural mountain bed. 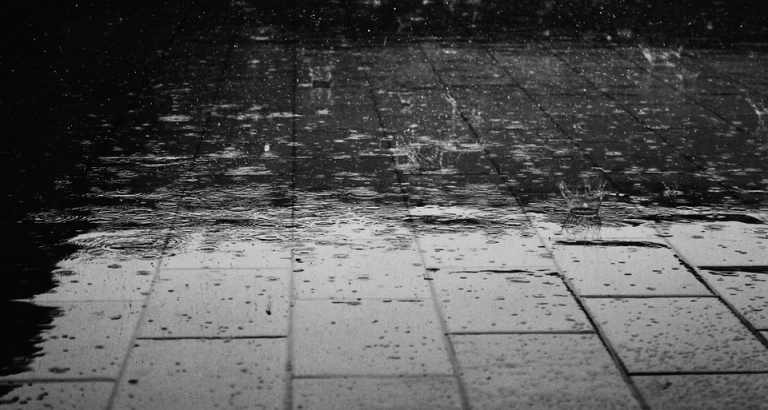 Members of our team have made a study of how rocks precisely affect the flow of water. Our efforts have been rewarded; Deck and Patio has received a multitude of awards for our waterscapes. Below are some examples of how we pull everything together. The rocks used in this Deck and Patio pond installation – some of which weigh over three tons — were imported from farmers’ fields in New Jersey, says Dave. Each rock was hand picked for its particular use, and sometimes for its ideal crevices in which perennials could be planted. Whenever Deck and Patio designs and builds a new waterscape or natural landscape retaining wall, moss rock is always part of the design. 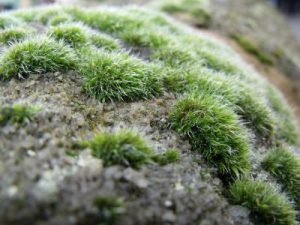 Moss grows well in shady areas, he adds. 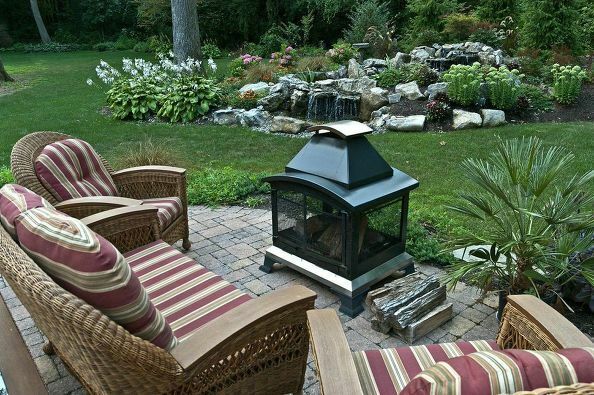 And along with ferns, it helps transform any backyard into a natural cool setting. “Of course, also choosing the right size rocks and knowing where to position them is essential for a natural-looking scene. When gravity urges water onward, it spills over rocks naturally, so it takes a trained eye to ensure any man-made waterscape add rocks as if nature had created the movement and water trail. For example, each “spill rock” along this Deck and Patio backyard stream was carefully chosen and positioned to depict the most natural water movement. 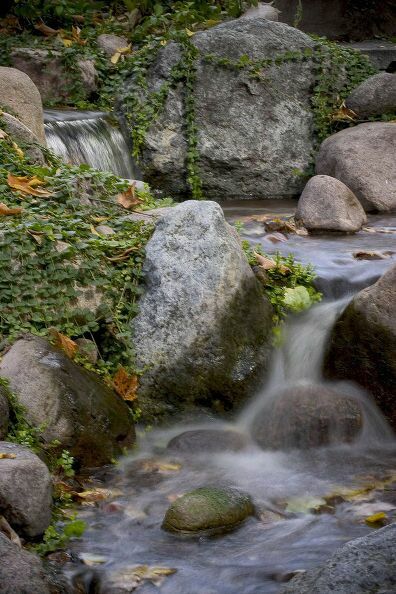 The stream flows down and over a 2-foot-by-2-foot-wide moss rock waterfall and cascades into a 10-foot-by-15-foot pond. It looks like it has always been there, part of the natural environment. When adding a water feature to existing landscape, we consider the color and texture of surrounding plant material, as well as how the plants will eventually grow. Here Deck and Patio planted low-lying evergreens and ground cover perennials in and around the stream and rock outcroppings. 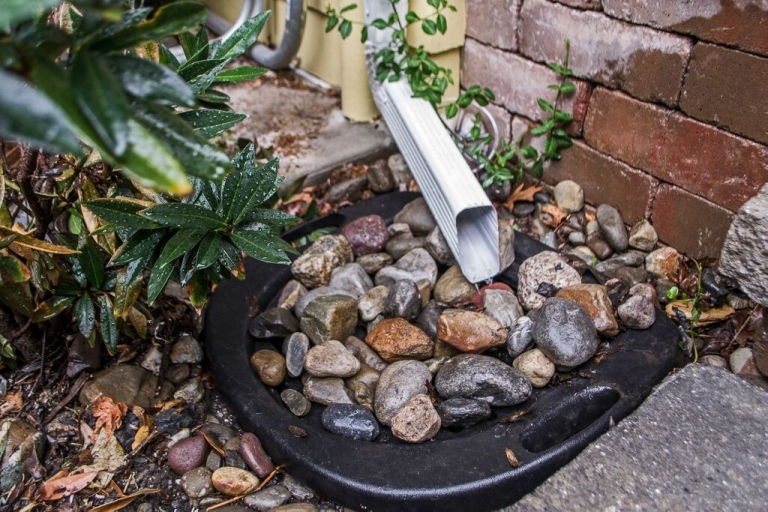 These soften the large boulders, which would otherwise stand out and spoil the natural look. Larger flowering plantings were installed behind the water feature to provide accenting and screening. 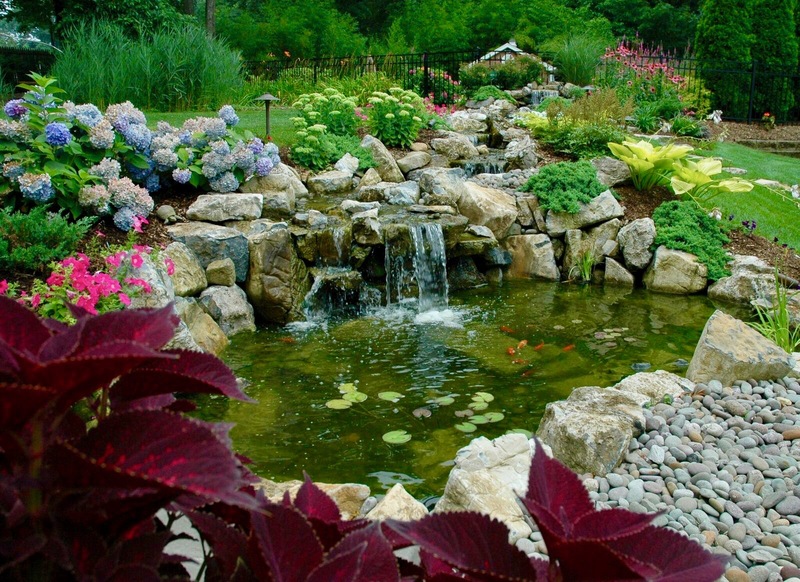 On lower portions of the slope, the water feature was planted with flowers for cutting and small beds for annuals so the client could interact with the stream garden throughout the season. • Floating Plants Submerged Plants. For this project, Deck and Patio also incorporated creeping evergreen ground covers that cascade and wind over and between the rocks we used. An expert selection of plants can provide color from April through October; note also that here, the whole design flows beautifully into the back property. 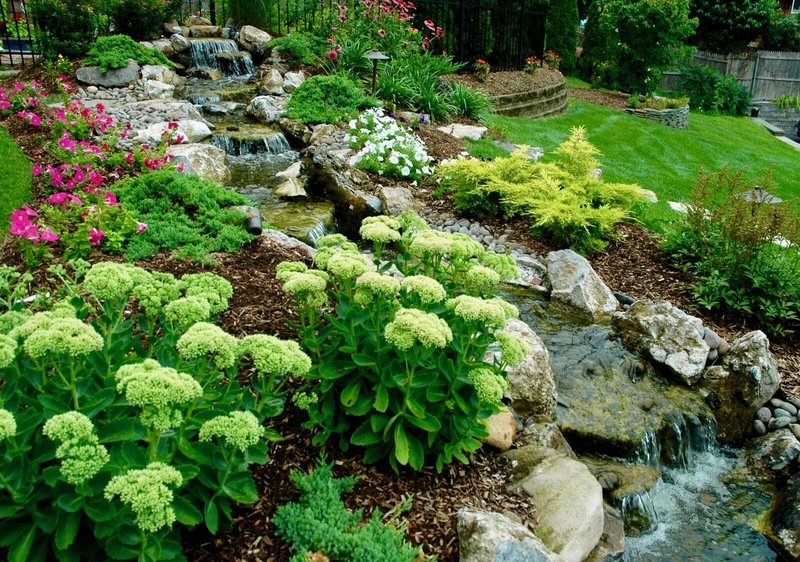 Surprisingly, a steep property grade can be a good thing when it comes to waterscapes. 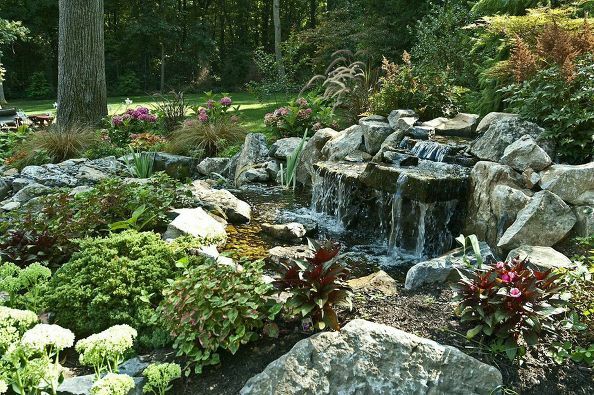 Such terrain not only offers an opportunity for drama but designing a water feature along such a slope will permit Mother Nature to do all the heavy lifting — or pushing the water along. 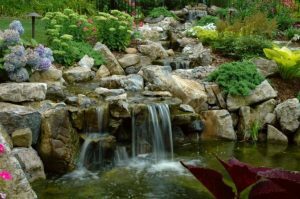 In this case we added a stream and plantings along such a property with five cascading waterfalls — using moss rock boulders, evergreens, perennials and annuals. 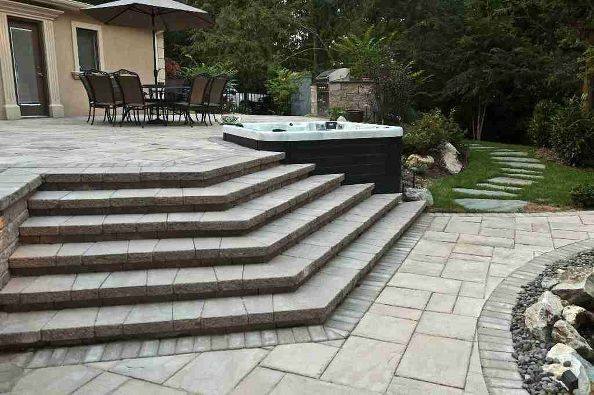 We also put in a series of stairs and landings to bring them down to the homeowners new pool area. Those in the know, like HGTV, have spotted a Japanese-inspired landscaping trend that’s expected to remain hot in the U.S. throughout 2018 and beyond. No, it doesn’t require a bathing suit. Or wild evening romps in the moonlight. 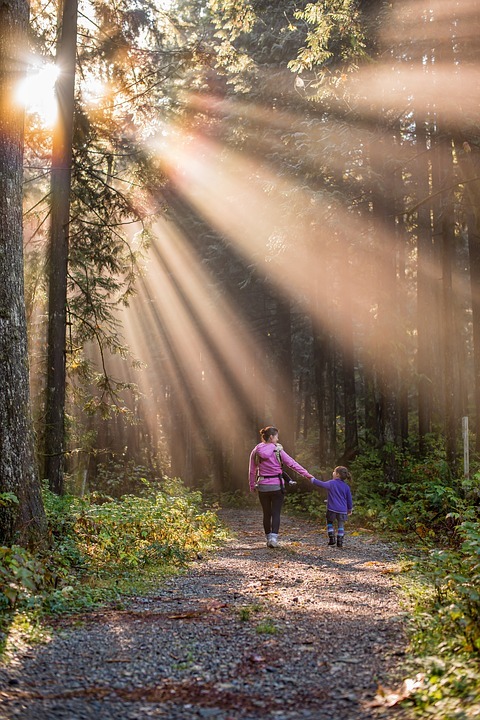 Forest bathing simply means bathing yourself in the beauty of a wooded area via a nature walk. The idea is to allow your inner spirit time to breathe — and any inner tensions to find release. This uplifting experience might also include spiritual moments of divine worship. But the essential key is to just give one’s technology-driven life a break. And no place offers a better space for that than a quiet woodland area. 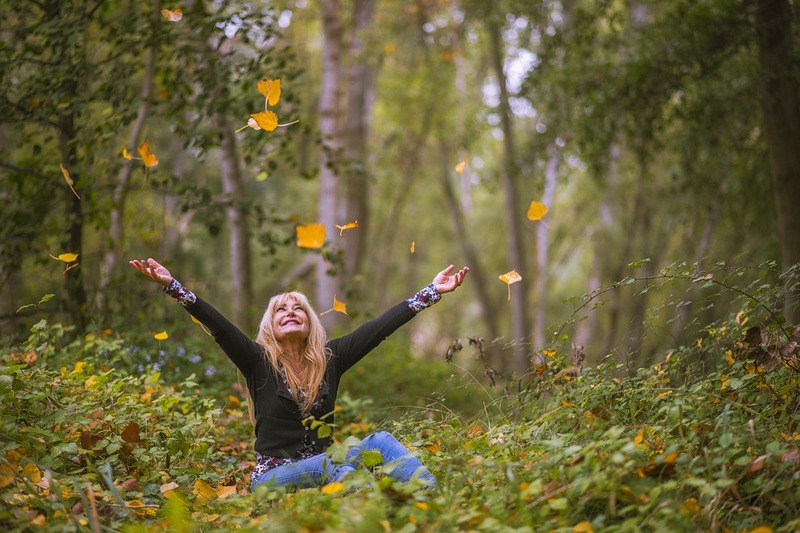 Forest bathing, by the way, is a translation of the Japanese term “shinrin-yoku” — a new philosophy that began in Japan in the 1980s and has been growing as fast as, well, a bamboo forest. At Deck and Patio we were delighted to learn of this “trend.” But our Huntington Station, NY-based firm — in collaboration with many of our nature-loving clients — has been designing such restful woodland backyard escapes all across Long Island for many years. There are two ways we accomplish this. 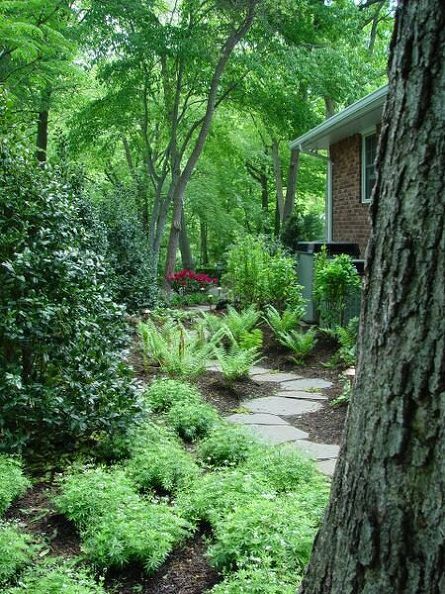 If a property already has beautiful woodlands, our goal is, first, to safeguard as much of this precious space as possible when creating nature walks and any other outdoor living areas. Plus, we often add man-made environmentally-friendly water features and plantings to make the wooded areas feel complete. The goal is always to enhance the experience of the parklands without doing harm to the surroundings. 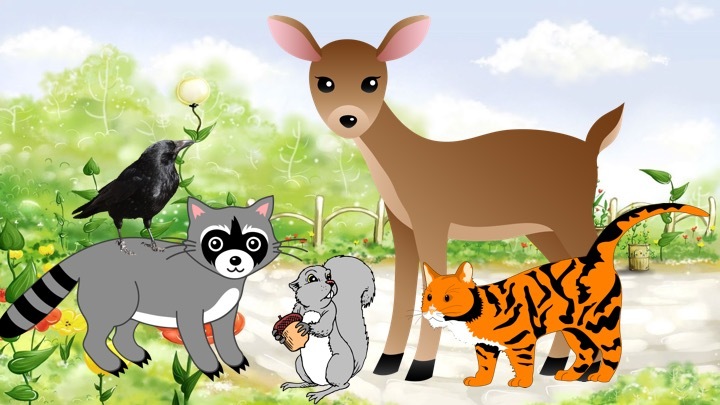 A second option — which can be more expensive — is to import new trees, shrubs and flowers to create an entirely new wilderness area where one does not exist. Here’s a few examples of Deck and Patio-landscaped ‘forest bathing’ areas we created for a few of our Long Island, NY clients. Here’s a great example of a pre-existing wooded area on a local property. Within this already beautiful setting, we added stone steps, streams and waterfalls. 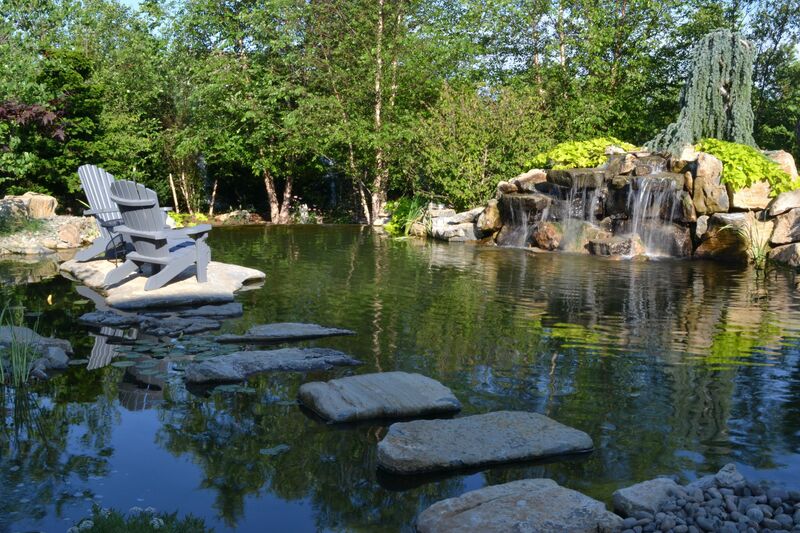 The clients already had a bridge so we designed water features and stepping areas to fit around it. We also added additional plantings and lots of green ground cover. It’s the perfect space for them to bathe in natural beauty before they start their day and when they return home. The key to forest bathing is to create or update spaces as they appear in nature — and add only amenities that fit naturally in that environment. 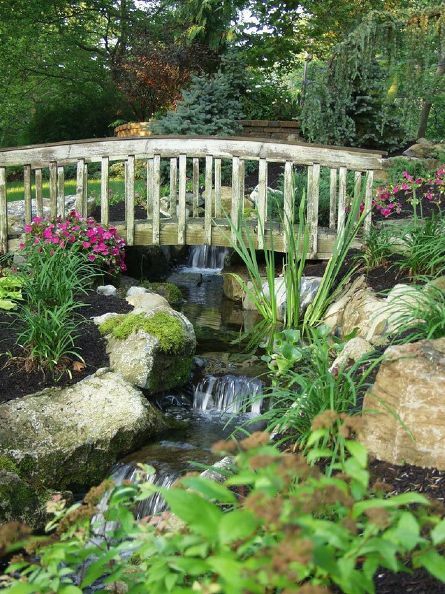 In this case, Deck and Patio added a bridge, water feature, imported boulders and rocks and landscaped it with robust plantings. It feels like you are in upstate New York, in the mountains. Yet, it’s right in our clients’ backyard. As you can see from this Deck and Patio-designed backyard refuge, we were careful to safeguard the existing woodland areas on the property. 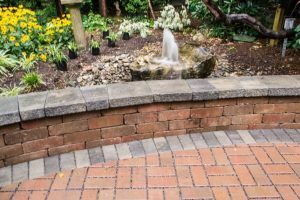 Extending out from the parkland areas, the new water feature was brought forward to the entertaining areas through the addition of a pondless waterfall. The new multi-level patios were carefully designed so that each patio space had a specific use. 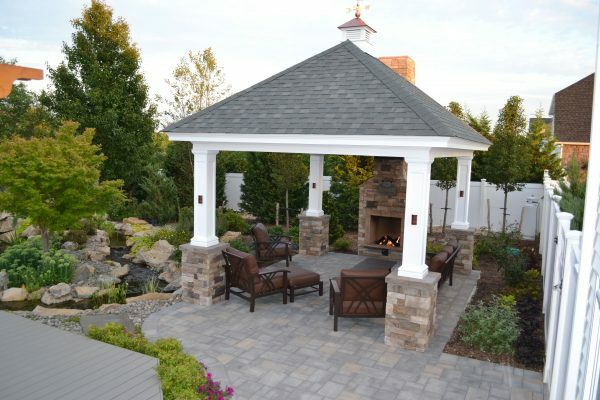 The complete project was a perfect blend of softscapes with hardscapes. Many believe that walking in natural surroundings is not only peaceful but by providing moments of peaceful contemplation, such walks can have a healing effect. 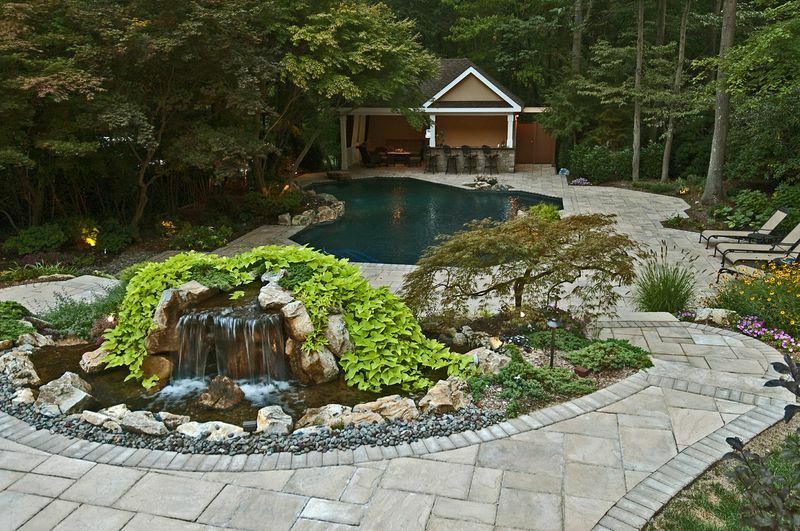 For this space, we took advantage of the family’s desire to hide their pool equipment by creating a private woodland path. We brought in bushes and plantings and fit them among existing old-growth trees. Adding bluestone stepping stones that lead to a larger woodland area contributes to an extended nature walk that is perfect for forest bathing. This Deck and Patio free-form pond and stream turned out to be a huge hit with the clients’ entire nature-loving family. The clients’ desire for a natural-scape in the yard helped inspire us at Deck and Patio as well, says owner Dave Stockwell. 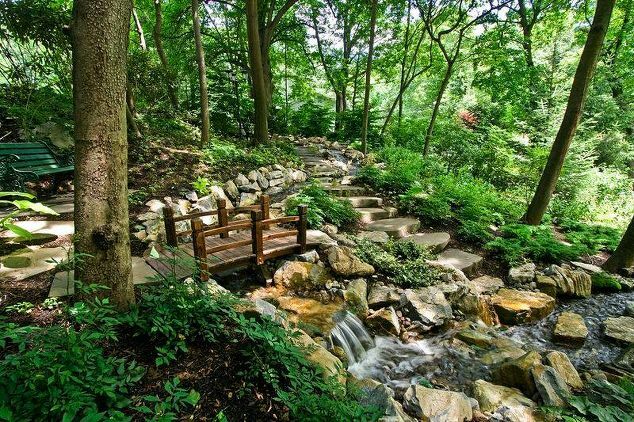 “Our design meandered the beautiful watery trail along their property’s formerly unused slope. Gravity is all that’s needed to move the water, so it’s also very energy-efficient. 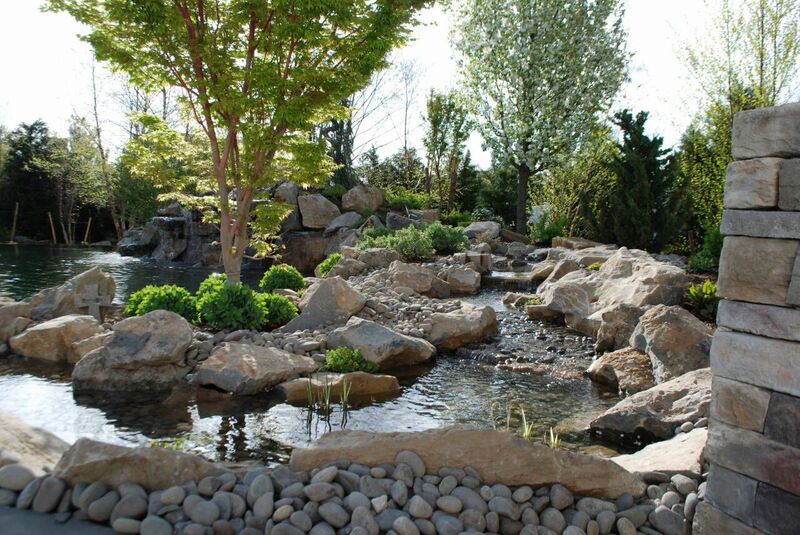 The 35-foot-stream includes natural moss rock boulders and plantings, as well as river stones positioned along its banks; the stream ends where it tumbles over moss rock waterfalls into a 10’-by-15’ fish pond. “The adjacent landscape is dotted with tall grasses (e.g., Miscanthus) and evergreens such as Juniper Parsoni, giving a lush backdrop to it all,” adds Dave. 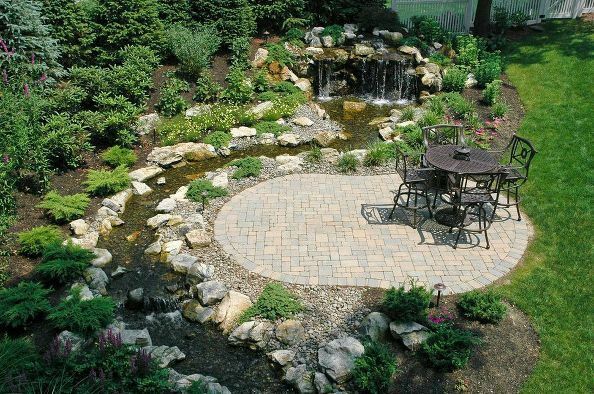 A natural setting such as this backyard project naturally attracts wildlife, which the homeowners particularly hoped would happen. 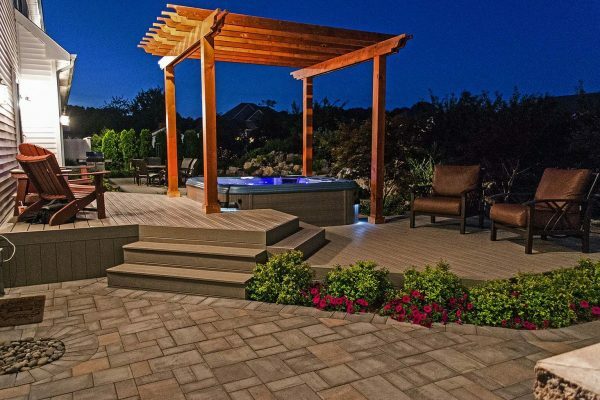 The Deck and Patio Company earned a Silver Award from the Northeast Spa and Pool Association (NESPA) for this project. 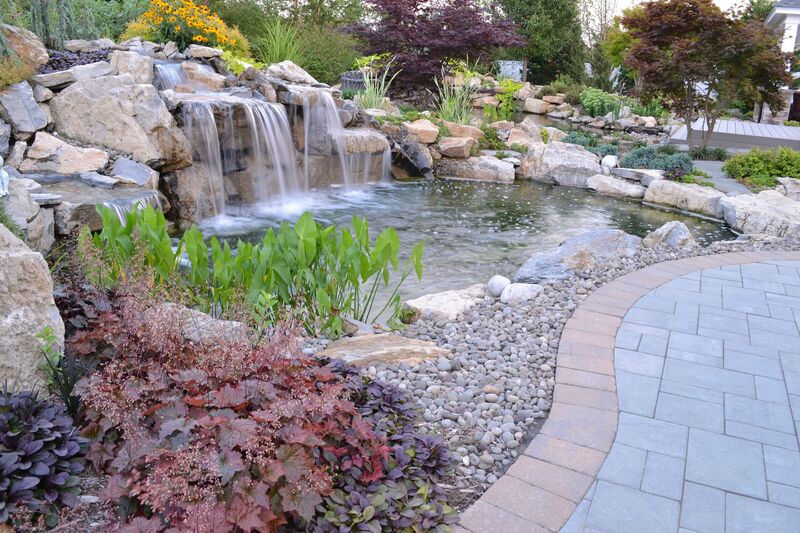 Deck and Patio used a flexible pond liner to create a free-form pond that would blend into the natural landscape. 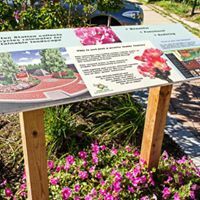 We planted Purple Cone flowers, Coreopsis and Spirea Anthony Waters, as well as tall grasses, and deep green ground cover. 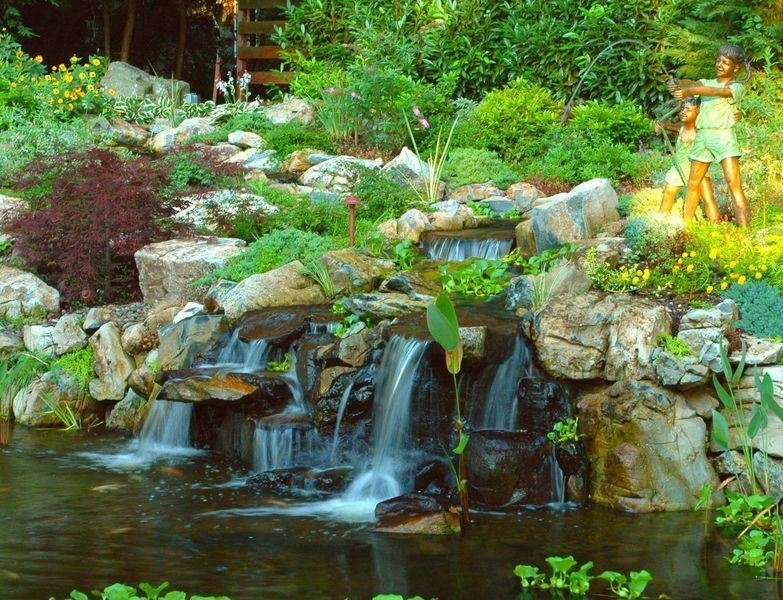 Together, the bursts of bright plant color and the sounds of moving water are soothing whether the clients are lounging by their pool, back patio or even in the house. Having gone to “pond college” at Aquascape, Inc’s Pondemonium, Deck and Patio’s team has learned to look at a property from various viewing points — from wherever the clients will be looking at the water feature, including the house. Here we posited an 11x 16 pond adjacent to their patio. Deck and Patio’s design called for an extended patio with bluestone stepping stones leading to the stream, natural stones to walk across it, and more bluestone on the other side up to the pool area. Pulling out all the stops of an organ increases the sound so an audience can hear everything — every grand sound, in all its lovely variations. 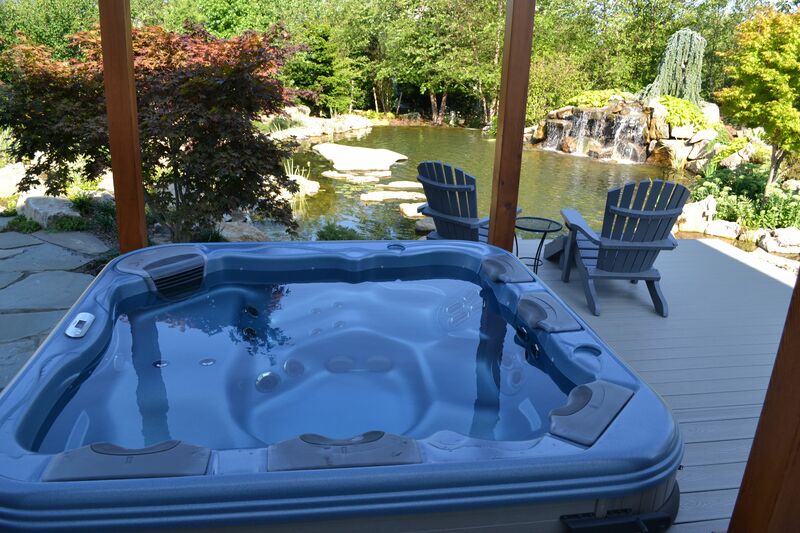 — a new hot tub (Bullfrog Spa) wedged in-between the upper and lower patios. 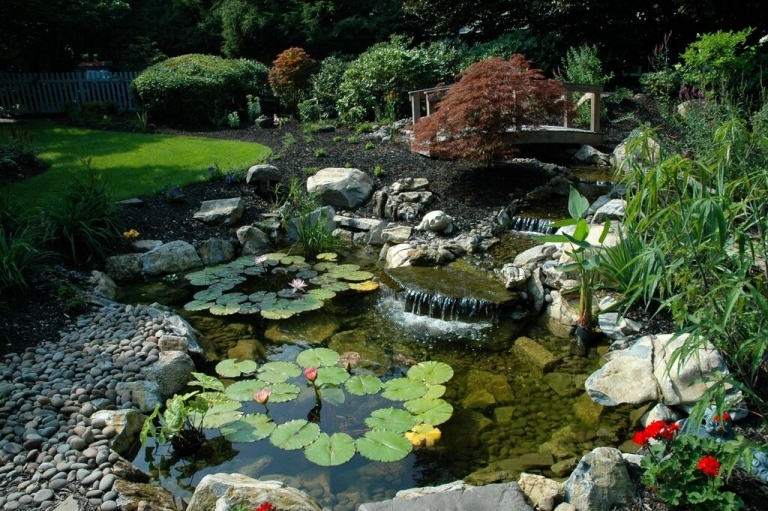 To ensure no use of Town water, Deck and Patio installed a ‘pondless’ reservoir system below the lower-level waterfall. The spills from the waterfall pass through river rock and gravel and is collected underground. Inside the reservoir, a pump recirculates the filtered water back up through the system. Also, by letting gravity pull the flowing water downward, the whole system is turned into a complete ‘green’ maintenance-free water source that can enjoy throughout most of the year. Deck and Patio’s toughest challenge was accurately measuring and cutting the vinyl liners needed for the pool itself and its in-pool stairs. 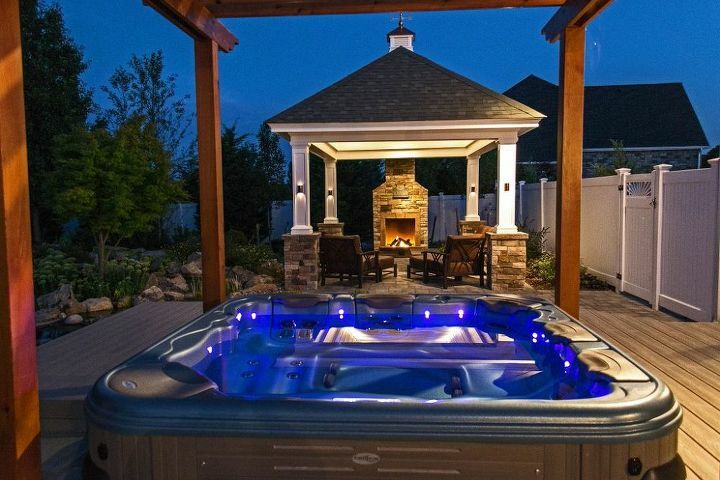 However, having done many vinyl-pools over the years, Deck and Patio’s team knew it would just require patience and steady attention to detail. The following photos highlight many of the project’s elements. This photo looks up from the custom pool pavilion (not seen) over the newly renovated vinyl pool, Techo-Bloc pool surround, a pair of natural stone steps leading to upper patio that flank the waterfalls, the lower-level waterfalls, and a portable spa set against the upper patio area. Not seen is the upper waterfall that faces the house. Looking down at the pool and new custom pavilion that grace the lower level, the eye is first captivated by an upper waterfall; its spilling water flows downward forming a stream behind that gravity pulls to the lower level. 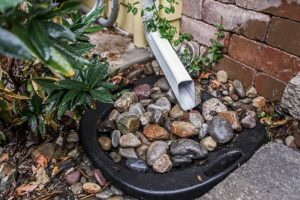 This part of the water feature was installed to face the house so it can be enjoyed from the upper patio as well as inside the home. 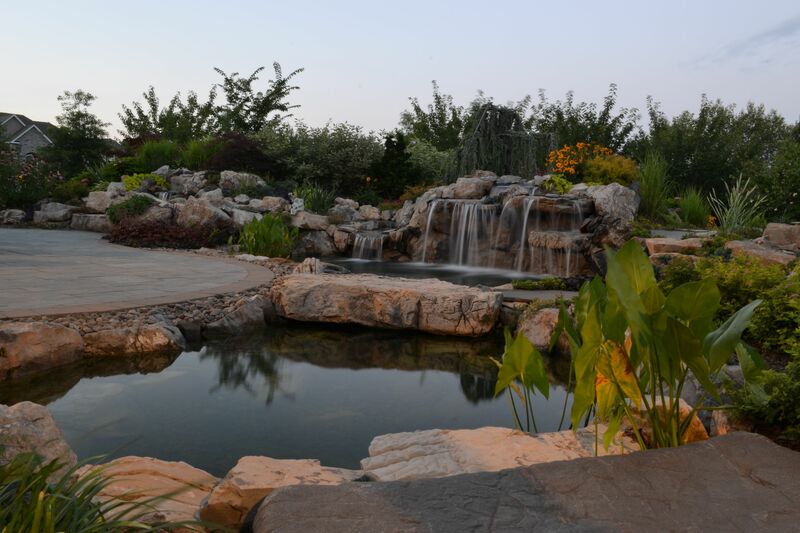 The complete water feature for this project includes a 10-by-15 foot freeform koi pond, which is regularly aerated by waterfalls from the 35-foot backyard meandering stream. 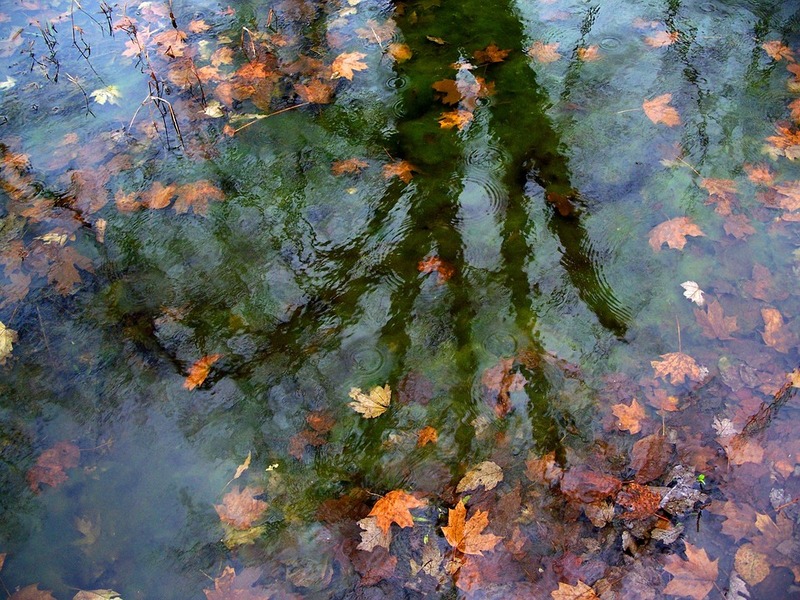 Parts of the property is natural woodland, so care was taken to protect the fish. Predators, that might live nearby, are discouraged from going after the fish by installation of a small cave where the fish can hide unseen — as well as remain dormant during winter months. 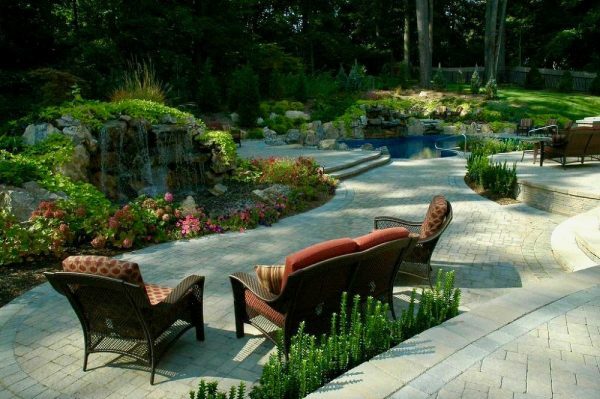 One reason we love Techo-Bloc products is because they appear natural. They come in kits with varying shapes that allow us to create an attractive design instead of being limited by one-sized bricks etc. 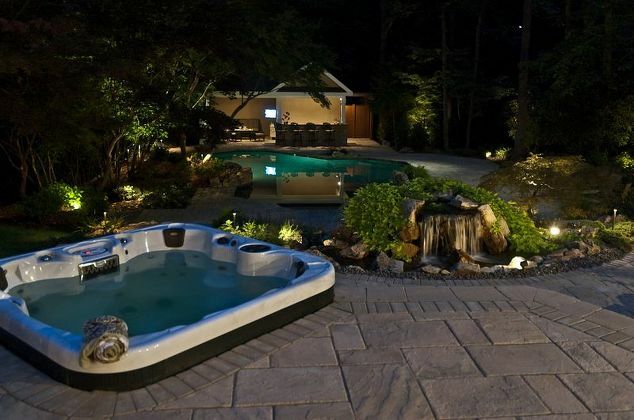 The Bullfrog Spa these clients chose fits snugly against the patio which was shaped to embrace it. This portable spa was positioned against the patio in a way to appear built-in — or custom. This way the clients have the best of both worlds, a handsome looking spa that is fitted with Bullfrog’s enviable massage jets — their patented JetPaks. One last thought. 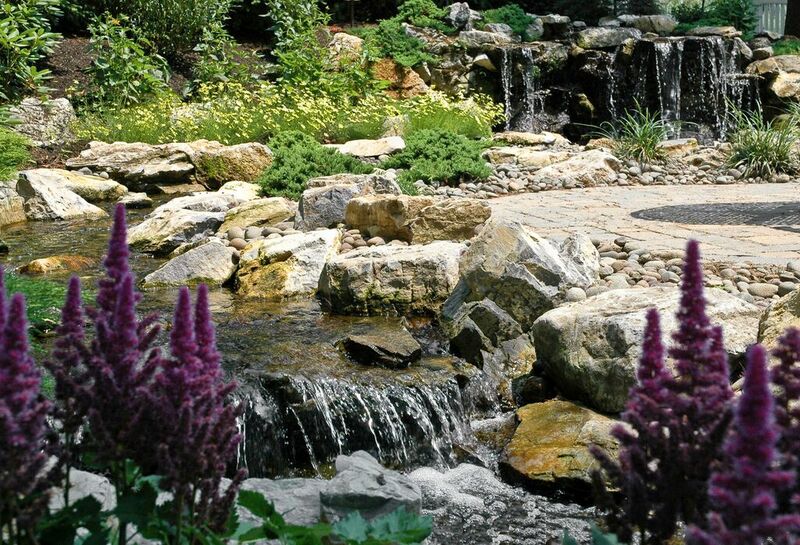 The Waterfalls, stream, double steps, moss rock and plantings along the change in grade together create a natural looking retaining wall — a great way to cut costs while increasing the aesthetics of a beautiful graded property. 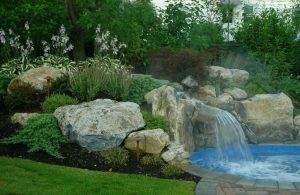 Sometimes, for a variety of reasons, clients want the beauty of a waterfall feature but don’t want it to include a pond. That was the case for these clients. They were saving for a swimming pool and wanted a water feature to enjoy in the meantime. Also, since their property was a delightful wooded lot, they asked that any feature look natural so it would fit in with the surroundings. The solution Deck and Patio suggested was for a “pondless” system that included a stream with upper and lower waterfalls. At the end of the stream, where usually a pond would capture the spilling water, we installed a “green” pondless-reservoir underground that holds the water and recirculates it. 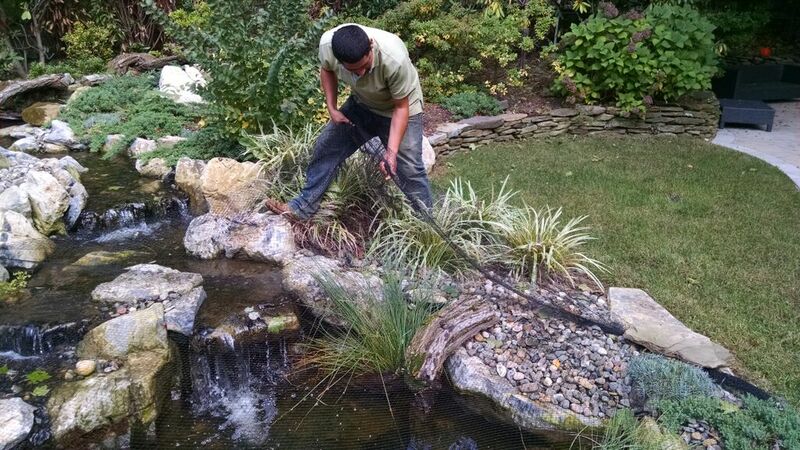 We were able to make use of the property’s slope and gravity to move the water down to the waterfall. 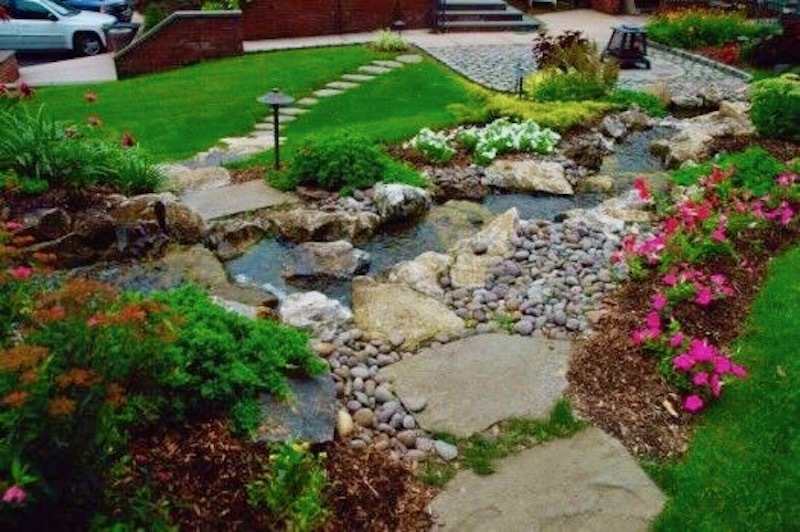 The water feature was fitted in an existing hill without need to change the terrain much at all. This location was also ideal because it meant the family could enjoy it from within the house as well as from the patio. 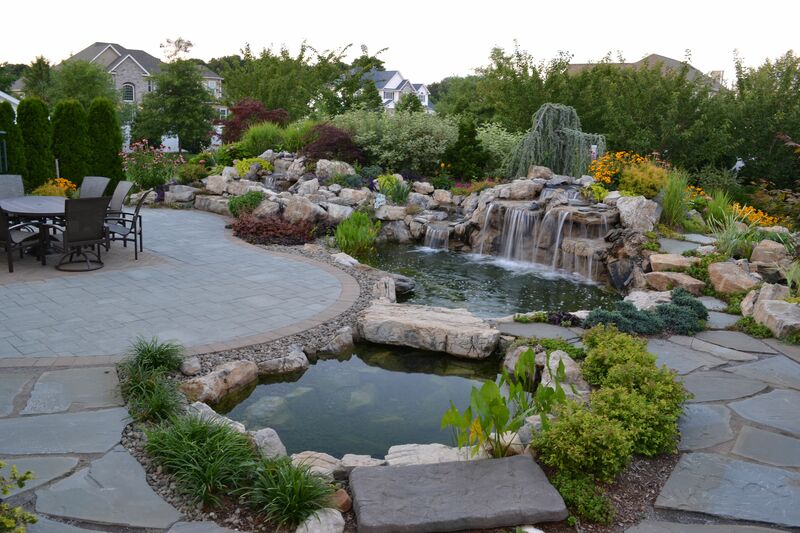 For our efforts, the Long Island Pool and Spa Association (LIPSA) awarded us a Silver Medal for the project. 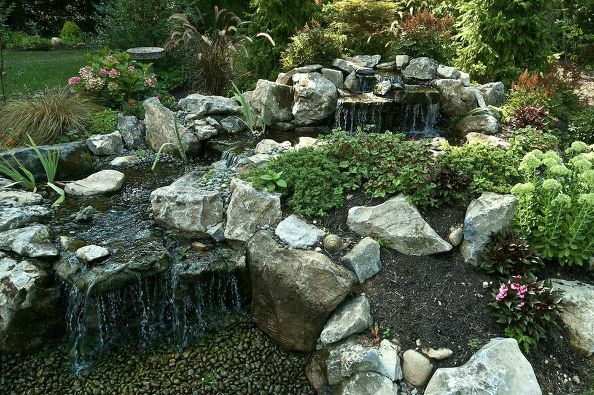 If you want a water feature (think stream and waterfalls) but don’t want a pond, then “pondless” is the way to go. 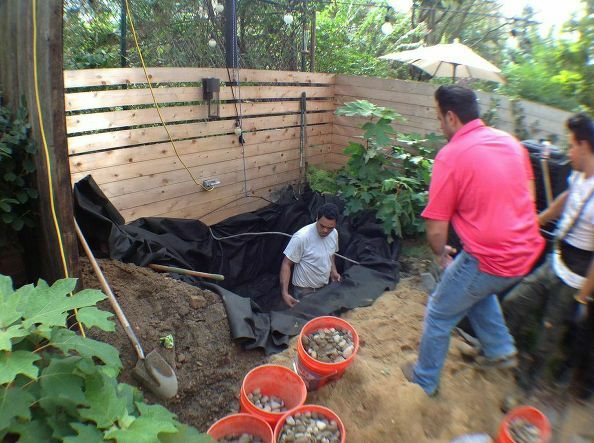 Here, Deck and Patio used Aquascape Inc.’s pondless system which captures the water underground and recirculates it. Note how the water seems to be disappearing into the gravel where it is collected in the reservoir and redistributed. We used evergreens (e.g., Procumbent Juniper) that are dense and green and very low maintenance; they also spread nicely. Begonias, Coleus, and flowering plants like Astilbe add punches of color. Note how Pennisetum plantings drape around the moss rock and natural stones; we also placed each stone and used gravity to move the water in different directions as it would appear in nature. Deck and Patio had previously built this handsome Techo-Bloc patio for the clients using “Elena” pavers in “Earth Brown.” The pavers come in kits with five differently-sized stones which allowed us to create a stylish random pattern. Along with the plantings mentioned above, Deck and Patio planted Blood Grass, Sedum Autumn Joy, Hosta Sum and Substance; one of the water plants is Yellow Flag Iris. We also included various deciduous shrubs as well as several Norway Spruce. 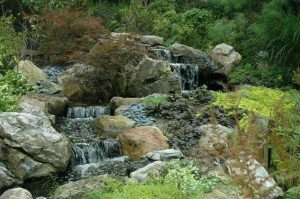 A Japanese Maple was added behind the upper waterfall for a its texture and color.